So many people live in apartments or condominiums in Toronto that it’s hard to imagine a time when renting a small portion of a larger building was a radical, even a shockingly salacious way of life. Amazingly, before 1899, there were no purpose-built apartment buildings in the city at all, making Toronto something of an anomaly in North America. Sure, people rented rooms or floors of sub-divided homes (The Ward, a notorious slum that used to be located near current City Hall, was densely populated much earlier), but nothing had been constructed specifically for that purpose. 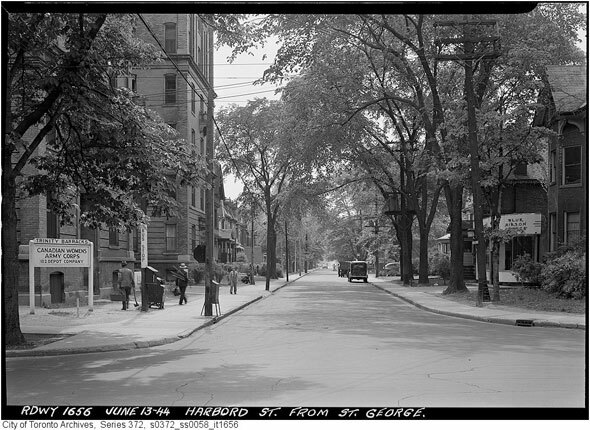 The first building in Toronto purpose-built for multiple occupancy was the St. George Mansions at 1 Harbord Street, directly opposite where the looming brutalist mass of Robarts Library would later sit. 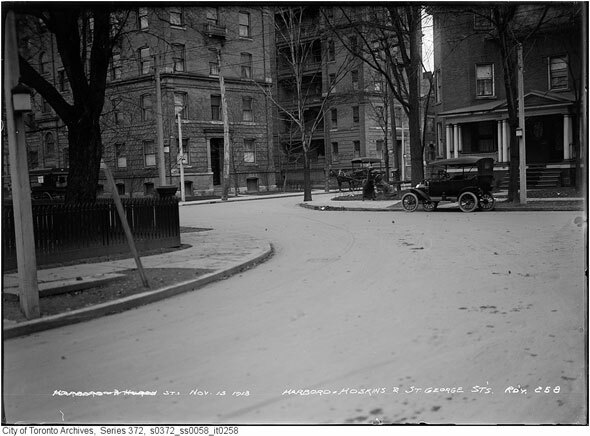 In 1905, the intersection was part of a relatively quiet and affluent neighbourhood west of the University of Toronto campus. Dappled sunshine filtered through young trees and little Model T Fords lined the curb. It was a “a district of substantial detached villas,” according to Richard Dennis in a 1989 research paper. Dennis discusses the St. George Mansions and the real estate market leading up to their construction in detail. As Dennis recalls, the permit for the building’s construction, the first of its type in Toronto, was issued in 1899 to A. W. McDougald, the president of the Improved Realty Co. of Toronto Ltd. He estimated the building would cost his company about $100,000 – the equivalent of about $2 million in today’s money. The six-storey pressed brick and Bedford stone building, roughly “C”-shaped with a partially enclosed courtyard, took about five years to complete. Many of its 34 apartments had access to balcony space, though some were decorative Juliet-style affairs with heavy stone balustrades. In 1904, shortly after it was finished, it contained 34 apartments and was home to 99 people, most of them wealthy middle-aged couples. Three barristers, two professors, two bank managers, and a director of an insurance company appeared on the occupancy list at that time. Toronto was slow compared to other North American cities to build its first apartment block. The living concept had already appeared in Detroit, Cleveland, Buffalo, and other nearby cities, and was established in the form of “apartment hotels” in Boston and New York City in the 1850s and 1860s. Apartment hotels were typically marketed at single, city-dwelling businessmen. Buildings such as the New York’s Stuyvesant Flats, built in 1869, had “between six and ten rooms each” and were let for $1,200 to $1,800 per year, according to Dennis. The buildings of this type often had a central restaurant, laundry, recreational facility, barber, and dentist—complete miniature communities for the residents that turned a handsome profit for the owners. The living concept became less communal and exclusive in the later decades of the 1800s. Apartment buildings that were constructed around this time were private and self-contained and became accessible to middle class families. The apartment building concept wasn’t without its detractors. 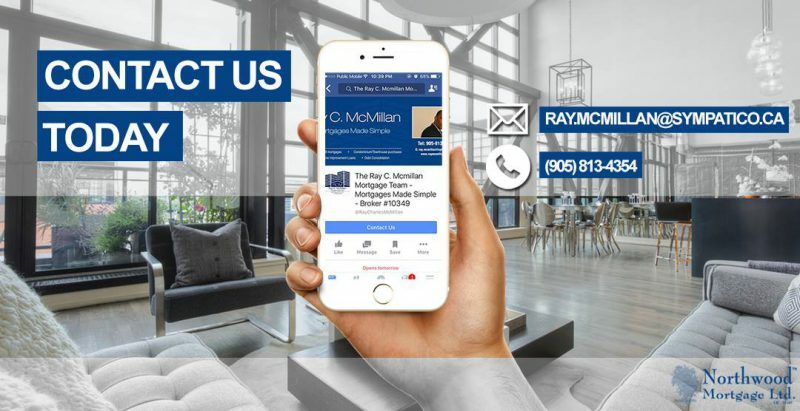 Observers fretted that apartment living was unsuitable for families, prompting one Milwaukee landlord to offer free rent for every child born or marriage proposed in his building. “It is a shortcut from the apartment house to the divorce court,” Dennis quotes the author of Housing Problems in America, written in 1917. The St. George Mansions were targeted firmly at middle class occupants when they were finished in 1904. Economic evidence suggested middle income families were less likely to move and were more numerous than the upper class renters, making them the perfect market to tap. Toronto’s rents spiked massively in the years the building was under construction – up to 95 per cent between 1897 and 1906 – in part due to a sudden uptick in immigration. There were more new arrivals than the number of new homes could accommodate, making apartment blocks and attractive idea for developers. The second Toronto apartment building was completed a year after the St. George Mansions on University Avenue. The stone, brick, and steel Alexandra was a larger building: 72 suites across seven floors with panoramic views of the city from its penthouse windows. Like the apartment hotels of New York, the property included a communal dining room and appealed to middle-class renters. 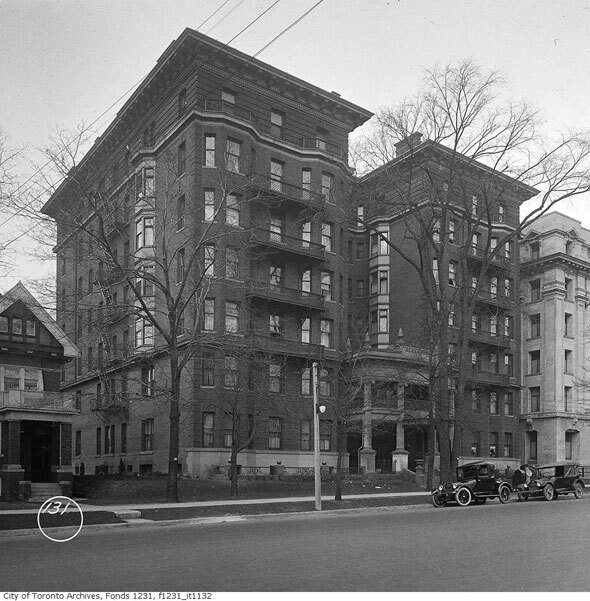 By 1907, Toronto had its first apartment building directory that included Sussex Court at 389 Huron St. and Spadina Gardens at 41-45 Spadina Road, both of which still exist. The St. George Mansions and the Alexandra are both sadly gone. The former survived until after the Second World War when it was repurposed as Trinity Barracks, the Toronto home of the Canadian Women’s Army Corps. One contemporary account described the building as “cockroach palace,” suggesting time wasn’t kind to Toronto’s first apartment complex. Today, U of T’s Ramsay Wright Zoological Laboratories building, built in 1965, occupies its former lot.